BOSTON--(BUSINESS WIRE)--Wayfair Inc. (NYSE:W), one of the world’s largest online destinations for the home, today announced that its augmented reality (AR) technology is now available to tens of millions of consumers on iOS 11, allowing shoppers to see 3D furniture and décor in their homes before they buy. Wayfair’s “View in Room 3D” app feature is seamlessly incorporated into the shopping experience, allowing customers to easily discover, visualize and purchase their favorite furniture and décor items from their iPhone or iPad – all within the Wayfair mobile shopping app. When shoppers find a piece of furniture or décor they love on the Wayfair app, they can simply tap the View in Room 3D button displayed beneath the product image to see it in their home. Shoppers can move products - which are anchored to the floor or table - anywhere in their room as well as rotate and walk around to view every possible angle, then instantly purchase without having to leave the Wayfair app. In addition, all 3D products are accurately sized to true dimensions, so shoppers don’t need to physically measure an item or their space beforehand to know that it will fit before they purchase. Developed using Apple’s ARKit, Wayfair’s AR-powered mobile shopping app is now available on iOS 11. Click here to download the Wayfair app. For a demo and screen shots visit http://bit.ly/ViewinRoom3DiOS11. Wayfair generated $3.9 billion in net revenue for the twelve months ended June 30, 2017. Headquartered in Boston, Massachusetts with operations throughout North America and Europe, the company employs more than 6,000 people. 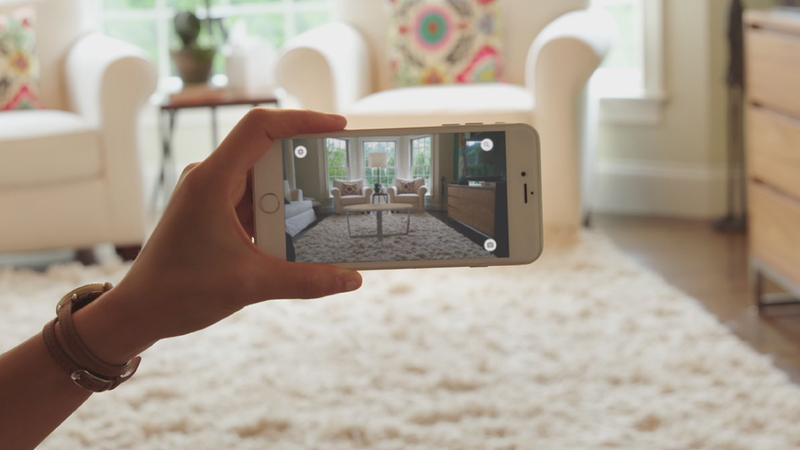 Wayfair's View in Room 3D mobile app feature lets shoppers see virtual furniture and decor in their homes before they buy via augmented reality (AR).